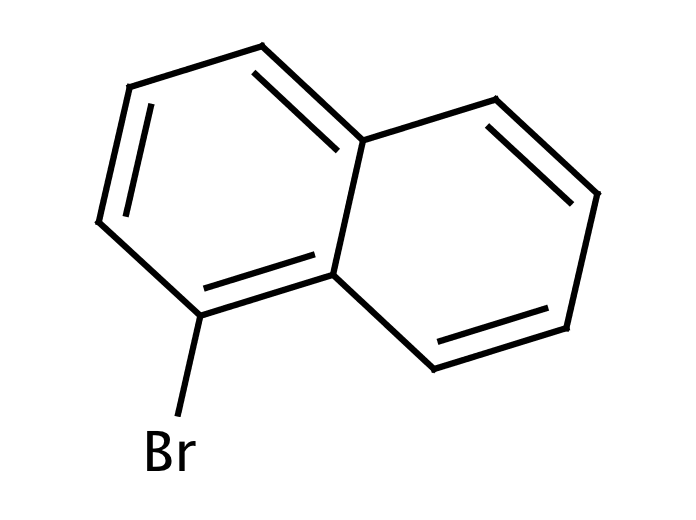 1-Bromonaphthalene is used in organic synthesis and refractometry of fats. It is used in the preparation of N-aryl imidazoles and diaryl ethers. It is used to determine the refractive index of crystals and the water content of alcohols. It is utilized in the preparation of glutathione peroxidase-like antioxidant activity of diaryl diselenides. Further, it serves as a solvent for the exfoliation and dispersion of hexabenzocoronene. In addition to this, it is used as a refrigerant and a solvent molecular weight substance. Send us your enquiry for 1-Bromonaphthalene. We offer custom pack sizes at special prices. We aim to respond to your enquiry within 24 hours. We value your input so if you have suggestions regarding new applications for 1-Bromonaphthalene email us and we will include your contribution on the website.